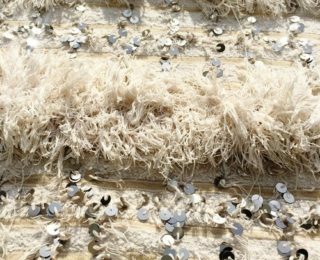 Handira is the Moroccan name for what is commonly referred to as a Wedding Blanket. 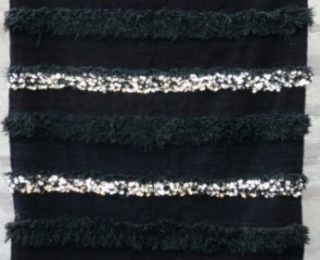 It is a traditional and symbolic textile worn by berber women when they get married. Handira can be used as a bedcover or as beautiful wall hanging. 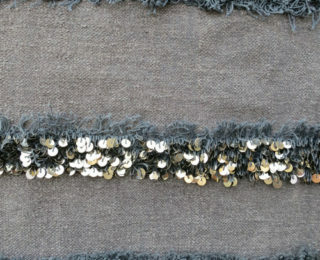 Over the years there can be rust that occurs from the metal sequins on these vintage blankets. Place of Origin: Handcrafted in Morocco Material: Wool + Cotton + Sequins Dimensions: 6'6" x 3'9" PLEASE NOTE: Please note these are handmade Vintage textiles and all vintage items have a unique history and character, so some may have slight wear and imperfections in weaving, pattern, or shape. We do try to have all rugs repaired before shipping, but keep in mind some imperfections preserve the character and integrity of the piece. Known as Moroccan wedding blankets, Handiras are woven out of sheep's wool, cotton, and linen by Berber women in the Middle Atlas mountains of Morocco. They can be used as a bedcover or wall hanging to add that special bohemian touch to any room. Note: These are vintage Handira blankets, circa 1980-1990s. There may be minor stains or discolorations on certain items, but no tears or holes. Please review the picture carefully before you buy. All Handiras have been washed in Marrakech and are spot cleaned.